Aye Caesar, but not gone! In 44BC Julius Caesar was assassinated 4 years later Octavian (Augustus) having achieved victory at the siege of Peruga, executed 300 senators and other noble folk, who had fought against him under relatives of Mark Anthony. Octavian undertook a series of similar actions as Caesars adopted heir to avenge his death. The 15th of March is now a date synonymous with the death of Caesar thanks to Shakespeare's line "Beware the Ides of March", I can't say they are wrong, not because of Caesar, because it means it is one week to my birthday. To be sure you all recognise me I am getting lots of practice wearing purple! The Ides of March, was the festival of Anna Perenna, the Goddess of Years. The Roman Calendar being lunar means the Ides of March would fall on the first Full Moon of the New Year. Ovid in his writings, provides a vivid description of the revelry and licentiousness of her outdoor festival where tents were pitched or bowers built from branches, where lad lay beside lass, and people asked that Anna bestow as many more years to them as they could drink cups of wine at the festival. 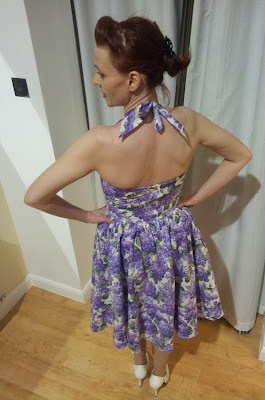 To represent spring and the bounties of the New Year I have opted for one of my Bernie Dexter Dresses, this is Belle in Lilac. I adore lilac the colour and lilac the plant. I had a lilac tree (technically they are bushes) for years but it blew down in the horrendous winds last year. I was heartbroken, until I realised a little sappling had survived. This is a pretty feminine dress complete with twirly skirt, it has a beautiful shaped sweetheart neckline that goes into a halterneck. This is my favourite style of top, it looks so cute tied with a bow at the back!